Word clouds are fun ways to get students thinking creatively about any topic. The problem is that it’s sometimes difficult to find the one that best meets your needs. Lucky for you, we’ve taken the dirty work out of it and compiled the 8 best free word cloud creation educational tools for teachers. Utilize these free educational technology tools to get your students’ minds immersed in any new topic. Editor's note: We have originally written and published this article in November 2013. Thanks to your useful suggestions and our own following of the latest developments in the fast paced field of technology, we have updated this piece in November 2015 in the hope that you will keep finding it useful. Thank you for sharing! ABCYa! Word Clouds is a simple and fun word cloud generator that caters to younger students. Click the link above to go to ABCYa!’s Word Cloud creation tool. Copy and paste, or type the text that you would like to use into the box underneath the heading that reads “type or paste text.” Next, click the arrow icon towards the bottom right of the screen. ABCYa! will generate a word cloud with a random layout. You are able to manipulate this layout by utilizing the slider bar at the bottom to adjust the amount of words used, or making use of the toolbar at the top of the word cloud. The toolbar allows you to change aspects of the cloud like font style, color, and the layout of your text. When you are done creating your cloud, click either the “save” or “print” buttons on the bottom left of the screen and share your cloud with friends or move on to a new one. TagCrowd is a simple word cloud creation tool. It requires no sign up and creates word clouds that look clean, organized, and professional. Get started with TagCrowd by clicking the link above to visit the site. Once there, decide whether you’d like to paste the text you’ll be using for your word cloud, provide a URL, or upload a file. After you make this decision, click the appropriate tab. Copy and paste your text, URL, or upload your file, then scroll down and adjust your options. Choose the language of the text, the amount of words you’d like to show, the minimum frequency for words to be shown, words you would not like to be shown (if any), and determine whether you’d like to show the frequency of each word’s occurrence and if you’d like to group similar words together or not. After you have done all of this, click the white “Visualize!” tab. TagCrowd will now generate your complete word cloud. Click “Save as…” and decide whether you would like to embed your word cloud on a website, print it, or convert it to a PDF. After this you are free to start another word cloud or utilize yours in the classroom. Tagul is a highly customizable word cloud creator that allows users to create unique word clouds from text, URL, or a list of tags. Click the Tagul link above and go to the homepage of the site. Find the blue “Sign up” link on the left side of the page and click it. Enter the required information and then click the gray “Sign up” button. Now check the inbox of the email you provided, find the message from Tagul, and click the link included in the message. You will be redirected to a page that contains a blue hyperlink that reads “Create new cloud,” click this link. You can now begin creating your cloud. Choose a tag source from one of the tabs under the green “Tags source” heading. Your options are: “Get tags from URL”, “Get tags from text”, and “List of tags”. Enter your URL, text, or tags, determine the case of your text, change the stemming algorithm if necessary, and decide if you would like to filter any common words. You are now able to change the appearance, fonts, and colors of your cloud. Make these changes if you desire, then click the big blue “Save changes” button. Once you are done altering the appearance of your cloud, save the image to your computer, put it on a web page, or send a link to a friend! Tagxedo (pronounced as “tag-SEE-doh”, similar to “tuxedo”, the stylish formal attire) is a great free tool that turns words –famous speeches, news articles, slogans, and themes– into a visually stunning word cloud. It is currently in beta for a limited time and you can use all the features in the product for now. After the beta period ends, certain advanced features –for example, custom shapes, custom fonts, high-effort mode, and save-as-app– will require premium subscription. But the free version will continue to cover a very rich set of functionalities (e.g. a choice of over 30 themes, over 30 fonts, and 30 free shapes to choose from). Click the Tagxedo link above and go to the homepage of the site. Click “Create” and start playing with it! Press the “Load” button and either enter a web page or paste a text. After this, you can play around with the shapes, the themes, and the fonts. The other thing you can change is “Orientation” (horizontal, vertical, of H/V). Once you’ve picked your themes, your colors, and the direction of your text you have many saving options (smaller or larger images). You can finally print your word cloud! Tricklar is a cloud generator that uses high quality media sources from around the world to form the basis of all word clouds. The most distinctive element of Tricklar’s cloud generator is its ability to add a fourth dimension, time, to the word cloud. There is no need for an email or registration in order to gain access to the news database to generate a cloud in Tricklar. Simply run the cloud generator and update the clouds appearance to suit the individual’s needs. Click the Tricklar link above and go to the homepage of the site. Select time, location, and topic to generate your cloud; by choosing your country perspective you can see the most relevant results to you. Choose between a generic category overview or keyword analysis in order to refine the results for the desired outputs. Customize the font, color, and shape of the word cloud through the cloud appearance menu to get a product that is suitable for your needs. WordClouds is a free word cloud generator that can be used with any modern browser on PC, Mac, tablet, or smartphone. Click the WordClouds link above and go to the homepage of the site. Go to “File” button and upload an Office document or PDF, open a URL, paste text (via the File dropdown), or edit the word list (dropdown) to enter the words and frequency for your own word cloud. Choose the size, shape, flatness, theme, colors, and font of your word cloud. You can also add links to your words: In the word list you can enter a URL after each word; the word then becomes clickable and points to the given URL. You can download the result as an HTML image map, via “File – Save as PNG/JPG + Image Map”. When you open the HTML file, the words in the cloud will be clickable. The word cloud images you create are yours to use any way you see fit; you are even allowed to use the generated word clouds commercially. 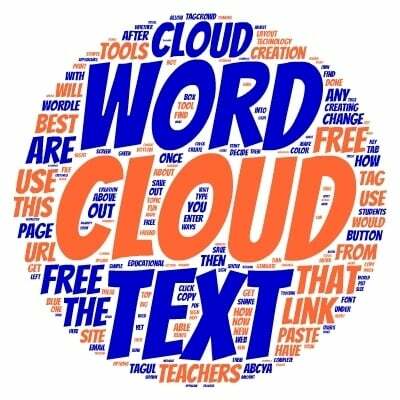 Word It Out is a word cloud creation tool that is easy to use and gives users many options for customizing their clouds. Begin using WordItOut by clicking the link above. Once you are on the site, click the blue “Create Your Own” button. Find the text you would like to make a word cloud from on a separate site or document, then copy and paste it into the box under “Enter your original text here”. After that, click the green “Word it out!” button and your word cloud will be complete. Take note that you are able to customize your word cloud after it is completed. To do this, scroll to the bottom of the page and change things like background color, font type and size, and the layout of your cloud. Once you have made your changes, click “Apply” to apply them to your cloud. Once you have completed work on your cloud, click the green “Save” button to the right of the screen. Enter a title, description, related web page, email address, and decide your sharing preferences for your cloud, then click “Ok”. Validate your email by checking your inbox and clicking the link in the email from WordItOut. You will be redirected to a page that contains the link for your word cloud. At this point you are able to be done working, or copy the link and share it with friends! Wordle is a simple yet sophisticated program for creating word clouds from text or a URL and sharing them with the world. Click the link above to visit Wordle’s site and find the bold “Create your own” text and click the “Create” hyperlink. Find the text you would like to create a word cloud from, copy it, and paste it into the box under the text that reads “Paste in a bunch of text” on the Wordle site. Alternatively, copy the link of a web page that you would like to create a word cloud from and paste it onto Wordle. Then click “Go”, if you have pasted in text, or the “Submit” button if you have copied and pasted a URL. Wordle will now generate your word cloud. Utilize the toolbar at the top of the cloud to change the appearance. Alter things like language, font, layout, and color until you have a word cloud that you are ready to show the world! Then print your cloud or save it to the public gallery. Word Clouds are great ways to get your students thinking about any topic in a new light. Use these 8 best free word cloud creation tools for teachers to allow your students to embrace their ingenuity and focus on key concepts in new ways. When it comes to finding the deeper meaning in a text passage, a word cloud is a simple application that you might have seen as a cute bit of fluff rather than a useful academic tool. Most word cloud programs work in the same, straight-forward way; the more a word is used in the text, the bigger it is shown in the cloud. A glance at a cloud is an easy way to preview a passage, or to analyze text. So what does this mean for your courses? I highly encourage you to read the article Word Clouds In Education: Turn A Toy Into A Tool.